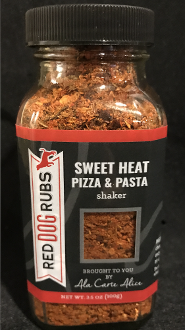 Sweet Heat Pizza and Pasta Gourmet Rub, Marinade and Seasoning. Great on Pizza , Pasta, Chicken, Meatballs. Try mixing with our Pepper Peach Glaze and cooking with Chicken or Meatballs for a party appetizer or Meal.